Thank you for inviting me to discuss rules for returning to work and overpayments due to work in the Disability Insurance (DI) program. I am David Weaver, Associate Commissioner for Research, Demonstration, and Employment Support at the Social Security Administration. The vitally important DI program provides insurance coverage to the families of workers who earned coverage for DI protection by paying payroll taxes and subsequently become disabled. We take the stewardship of the DI program seriously, and have a proven track record of administering it prudently and accurately. Program integrity and the protection of trust fund and tax dollars has long been a cornerstone of SSA’s mission, and accordingly, we strongly support the Federal Government’s strong efforts to combat fraud and curb improper payments. We are equally committed to helping Social Security beneficiaries with disabilities reenter the workforce when possible. I will provide an overview of the DI and return-to-work programs, including an explanation of the statutory and administrative challenges that can lead to overpayments. I will also discuss our continuing efforts to improve our already high levels of payment accuracy. We administer a number of programs, including the Old-Age, Survivors (OASI), and Disability Insurance (DI) program, commonly referred to as “Social Security.” Social Security is a social insurance program under which workers earn coverage for retirement, survivors, and disability benefits by working and paying Social Security taxes on their earnings. The DI portion of Social Security helps replace a portion of the lost earnings for workers who, due to their significant health problems, may no longer be able to work to support themselves and their families. DI also ensures that workers who become disabled and their families are protected from the loss of future retirement benefits. The same people who may be receiving disability benefits today at 55 will be receiving retirement benefits when they reach 66.
reviews, which are validated by a third party auditor, indicate that our OASDI benefit payments are highly accurate—nearly 99.5 percent of all OASDI payments are free of overpayment, and over 99.9 percent are free of underpayment. In addition, we continue to improve our processes in order to minimize and prevent overpayments2 in the DI program when possible, and when they do occur, we seek to correct them as soon as possible. We are pleased to report that the number of overpayments due to a DI beneficiary’s work (or other factors) remains low, despite the complexities of statutory work incentives. As of FY 2014, we estimate the 5-year average amount of overpayments due to work was less than one percent. Once SSA does identify an overpayment, our employees work diligently to recoup that amount from beneficiaries through a variety of means. Nevertheless, as we recognize that even one incorrect payment can result in a significant amount of overpaid dollars, we continue to look for ways to refine our administrative processes and improve returnto- work programs to help reduce work-related overpayments. The Social Security Act (Act) generally defines disability as the inability to engage in any substantial gainful activity3 (SGA) due to a physical or mental impairment that has lasted or is expected to last at least one year or to result in death. Under the Act’s strict standard, workers can qualify for DI benefits only if they are insured for Social Security disability protection – meaning they worked substantially in five of the past 10 years before becoming disabled4 – and cannot currently work due to a medically determinable impairment. As the House Committee on Ways and Means noted in its report that accompanied the Social Security Amendments of 1956, even a person with a severe impairment cannot receive disability benefits if he or she can engage in any SGA. Moreover, the Act does not provide short-term or partial disability benefits. women die within five years of the onset of their disabilities. Clearly, the DI program provides insured coverage for those Americans who make up a very vulnerable segment of society. While the DI program constitutes a part of our Nation’s social insurance, the level of benefits is modest. For example, in January 2015, a worker eligible for DI receives, on average, less than $1,200 in DI benefits per month, or less than $14,000 per year – just above the poverty line. The Trial Work Period (TWP). Section 222(c) of the Social Security Act (Act) allows beneficiaries to test their ability to work for at least nine months. During the TWP, beneficiaries receive their full benefits regardless of how high their earnings might be, as long as they have not fraudulently concealed work activity and they continue to have a disabling impairment. The TWP continues until the beneficiary accumulates nine months (not necessarily consecutive) in which he or she performed “services” within a rolling 60-consecutive-month period. In 2015, we consider work to be “services” if the beneficiary earns more than $780 a month, or works more than 80 self-employed hours in a month. The Extended Period of Eligibility (EPE). Section 223(a)(1) of the Act provides that, at the end of the TWP, a 36-consecutive-month EPE begins, unless we find that the beneficiary has medically improved and no longer meets the definition of disability. During the EPE, we pay benefits for the first month that earnings exceed SGA and the next 2 months, (we refer to this as the “grace period”) and any month the beneficiary’s earnings do not exceed SGA. After the EPE ends, benefits terminate if a beneficiary's earnings exceed the SGA level in any month. Exclusion of Impairment-Related Work Expenses (IRWE). Section 223(d)(4) of the Act requires us to deduct the out-of-pocket costs for disability-related items and services that a beneficiary needs in order to work when we determine if work is SGA. Expedited Reinstatement (EXR). Sections 223(i) and 1631(p) of the Act enable us to start benefits again without a new application if a person stops working within five years of the previous termination date. To be eligible for EXR, the beneficiary must: 1) have had his or her benefits terminated due to work; 2) become unable to continue working at SGA, within 5 years of that termination; and 3) have the same or a related medical impairment. Extended Medicare. Section 226(b) of the Act provides that if a beneficiary’s benefits are terminated because of work, Medicare coverage will continue for at least 93 months after the end of the trial work period (at least eight and one-half years from first return to work). Medicaid While Working. Section 1619(b) of the Act provides that Medicaid coverage can continue even if earnings are too high to allow an SSI payment. Medicaid coverage will continue until an individual's earnings reach an annual “threshold” level. Each State establishes a threshold level every year. Section 1619(b)(1)(D) of the Act, also allows us to determine individualized thresholds for individuals with extremely high medical costs they would be unable to pay without Medicaid. For beneficiaries with disabilities who seek to return to work, extension of medical coverage for an extended period can be an important work incentive. Vocational Rehabilitation (VR) Cost Reimbursement Program.5 Today, the VR cost reimbursement program, governed by section 222(d) of the Act, is the primary employment support program used by our beneficiaries. VR cost reimbursement came into existence in the early 1980s after Congress determined that more accountability was required of State VR agencies receiving Trust Fund dollars to provide services to our beneficiaries. The program requires a State VR agency to file a reimbursement claim with us after the agency completes its work with a beneficiary and that beneficiary becomes employed. The claim documents the services provided and the cost of those services, both direct and indirect. Once we verify that the beneficiary earned an amount sufficient to allow reimbursement, the State VR agency receives funds from us as program income.6 The statutory reimbursement standard for State VR agencies is earnings at the SGA level for a continuous period of nine months. In FY 2014, almost 324,000 of our beneficiaries were served by State VR programs. agency. We contract with ENs (which are qualified State, local, or private organizations) to provide or coordinate the delivery of employment support services to our disability beneficiaries. Some State VR agencies also act as ENs. Beneficiaries, ENs, and State VR agencies voluntarily participate in the Ticket to Work program. An EN decides whether to accept a Ticket from the beneficiary. Once a beneficiary assigns a Ticket to an EN, the EN provides employment support services to assist the beneficiary in obtaining self-supporting employment. The beneficiary receives these services at no charge. Consistent with congressional intent, we pay an EN only when the EN is successful in assisting beneficiaries secure and maintain employment. In FY 2014, almost 85,000 of our beneficiaries were served by ENs. Demonstration Projects.8 We believe conducting demonstration projects is the best way to gather the evidence policymakers need to evaluate policy options and consider potential program innovations that would improve the ability of individuals with disabilities to succeed in the workforce. We have already tested various initiatives that support DI beneficiaries, so a partial evidence base for policy innovation exists. For instance, the Accelerated Benefits demonstration found that providing health benefits to uninsured DI beneficiaries in the 24-month Medicare waiting period sharply improved their self-reported health status, and providing employment services increased work and earnings. The Mental Health Treatment Study demonstration found that employment supports, along with medical support and coordinated care, were successful in improving health, lowering hospitalizations, and increasing employment for DI beneficiaries with schizophrenia and other affective disorders. Other initiatives, such as the Youth Transition Demonstration, have found that support services can increase employment and earnings for younger beneficiaries. In addition, we are currently conducting the Benefit Offset National Demonstration (BOND). The purpose of BOND is to determine the effect of various interventions, in combination with a benefit offset, on employment outcomes including wages, benefits, hours worked, and job retention. In BOND, we are testing a $1 reduction in benefits for every $2 in earnings over substantial gainful activity levels, in combination with benefits counseling, with the goal of helping beneficiaries with disabilities return to work. The project will give beneficiaries a gradual reduction in their benefits, eliminating the current abrupt loss of cash benefits under the SSDI disability program when a beneficiary works and has earnings over a specific amount. Participants will maintain ongoing eligibility for health care benefits and other supports linked to SSDI eligibility. Recent reports on the early effects of the offset have found no effect on earnings for one treatment group, but positive effects on earnings for another treatment group.9 Full results, based on several years of earnings, will be available in a final report to be published at the end of 2017.
train field office personnel to explain work incentives. fund the Work Incentive Planning Assistance (WIPA) program,10 which helps disability beneficiaries understand the return-to-work program rules and how they interact with other Federal and State programs. The goal of the WIPA program is to enable beneficiaries with disabilities to make informed choices about work, and to support working beneficiaries to make a successful transition to self-sufficiency. publish information on our website and in printed publications, such as the Red Book, to help people understand DI program rules. 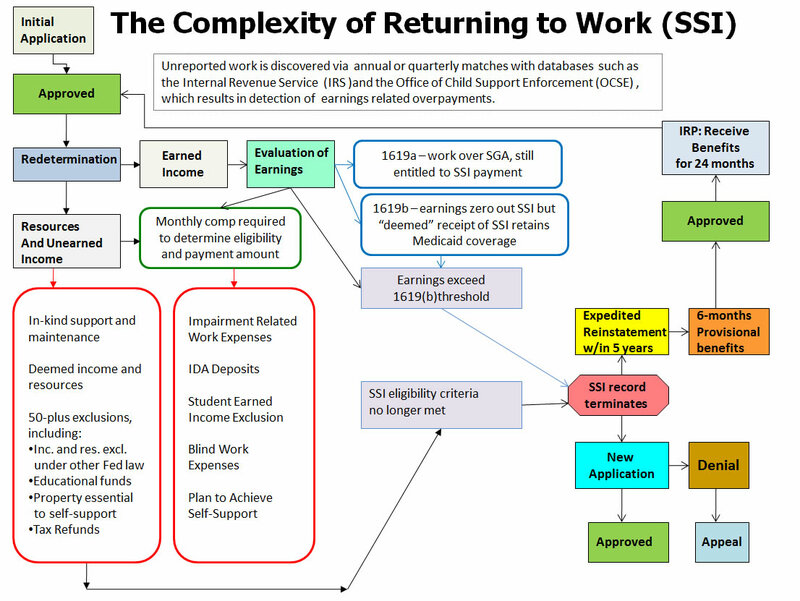 Nevertheless, as illustrated by the chart below, the statutory work incentive provisions are complex. 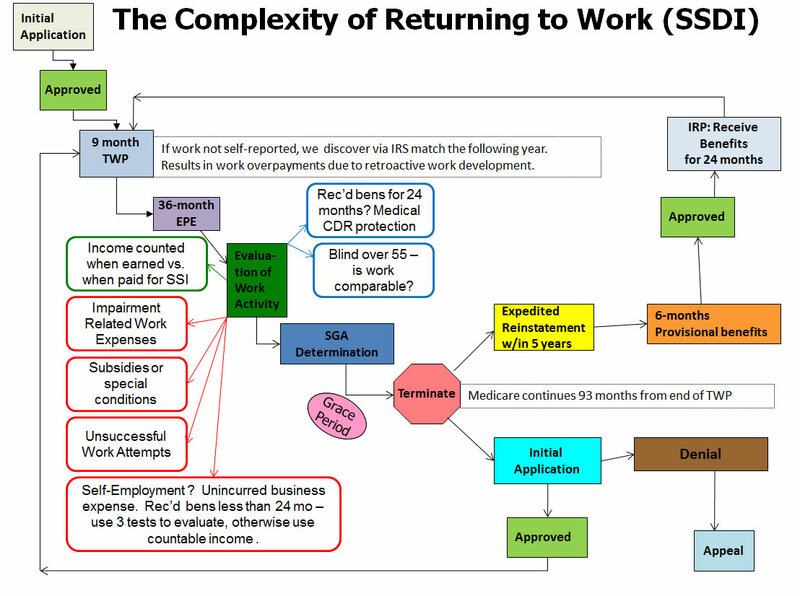 The statutory work incentive rules are more complex for individuals who receive both DI and SSI, as demonstrated in the next chart. We take every opportunity to tell beneficiaries and their representatives to promptly report any changes in work activity. At the time an individual applies for benefits, after he or she is awarded benefits, and periodically thereafter, we tell the individual verbally and in our written notices that he or she must report changes in employment and earnings, as they may affect benefits. Specifically, we remind applicants and beneficiaries that we need to know right away if they take a job or become self-employed—no matter how much they earn—if they stop work, or if there are any changes in job duties, hours of work, disability-related work expenses, or rate of pay. We generally receive work reports directly from claimants and beneficiaries, or through an automated Continuing Disability Review Enforcement Operation (CDREO) process (described below). DI beneficiaries or their representatives may report their work and earnings via fax, phone, mail, or in person at their local Social Security office. When we receive a work report from a disabled beneficiary, a technician inputs the information into our system and immediately issues a receipt to the reporting beneficiary, as required by Section 202 of the Social Security Protection Act (SSPA) of 2004 (Public Law 108-203). We then conduct a screening process, called a work review, to determine if the earnings may affect benefits. If benefits are not affected—for example, the beneficiary is still in the Trial Work Period—we do not take further action. If benefits may be affected, we conduct a work continuing disability review (work CDR). Our field offices process the majority of these work CDRs. beneficiaries who may have returned to work. CDREO identifies earnings DI beneficiaries did not report to us and earnings that beneficiaries may have already reported but we have not yet developed as part of the work CDR process. CDREO selects cases for work CDRs based on the amount of earnings, certain medical re-examination information on the record, and other pertinent criteria. Our Processing Centers process the majority of CDREO alerts. This process helps us maintain our extremely high levels of DI payment accuracy; however, IRS earnings data is reported annually, so there is some delay in processing CDREO alerts. The President’s FY 2016 Budget proposes several strategies to improve our ability to match to other administrative wage data, as I will discuss later. After completing a work review that screens an individual’s earnings, we may decide that a work CDR is warranted. Work CDRs are one of our most resource-intensive administrative workloads due to the complexity of work incentive programs, as well as the need to follow up with beneficiaries to determine whether their work qualified for any statutory work incentives. Work CDRs evaluate a beneficiary’s work activity to determine if the work represents SGA and if eligibility for benefits should continue. For DI beneficiaries, we count earnings in the month they are earned, not the month in which they are paid. Since SGA is a factor of entitlement for DI, the performance of SGA after entitlement (following a trial work period) may mean that the beneficiary no longer meets the disability requirements, and benefits will end. subsequent reinstatements or suspensions of benefits during the extended period of eligibility. In 2013, we also implemented a nationwide process improvement, the CDREO Predictive Model (Predictive Model), to help us more efficiently prioritize work CDRs. The Predictive Model helps minimize overpayments by allowing us to target the cases most likely to result in large overpayments for immediate attention. In addition, in 2012 we initiated the Automatic Earnings Reappraisal Operation (AERO) Delay Project, which delays the benefit increase resulting from an AERO re-computation for disability beneficiaries who have a pending work CDR. The Predictive Model and AERO Delay Project also help ensure that we give precedence to the cases that require primary attention as part of the CDREO process. payment accuracy in the DI program. The potential for an overpayment may discourage some disability beneficiaries from working, and we have taken several steps to handle our work reviews and work CDRs more quickly and efficiently. As previously discussed, we implemented the Predictive Model nationwide in June 2013. Since 2011, the average overpayment amount has decreased from $19,500 to $16,200, while the total overpayments due to work have decreased due to this enhancement. Based on the success of the predictive model, in 2014, we implemented a pilot in the New York Processing Center using quarterly earnings data received from the Office of Child Support Enforcement to initiate work CDRs for beneficiaries who are participating in the Ticket to Work program. The quarterly earnings data are more recent than the annual IRS data used in the CDREO process. Because we are identifying the cases earlier, we can reduce overpayments by taking action earlier. We expanded the pilot in February of 2015 to include two additional Processing Centers. The expanded pilot will give us an opportunity to coordinate with the existing CDREO process and refine screening criteria to target cases completing the Trial Work Period or working above SGA. We plan to release evaluation results from the NY pilot later this year. In addition, we have a robust debt collection program to recover overpayments in our programs, which enabled us to recover about $900 million dollars in DI benefit overpayments in FY 2014. Please see our report on reducing improper payments that describes our debt collection efforts at http://www.socialsecurity.gov/improperpayments/recoveryEfforts.html. updating our work review instructions to improve coordination between our field offices and processing centers. Move from Annual to Quarterly Wage Reporting. Employers report wages annually to SSA. However, from 1939 through 1977, employers reported wages on a quarterly basis. Increasing the frequency of wage reporting could enhance tax administration. More frequent reporting may improve program integrity by detecting work on the part of DI and SSI recipients more quickly and providing timelier wage data for use by Federal, income-tested programs. This proposal would revert to quarterly wage reporting. The Administration has pledged to work with the States and employers to minimize any burden as employers already report quarterly to the States. authorizing SSA to conduct data matches with private commercial databases and use that information to automatically increase or decrease benefits accordingly, after proper notification. 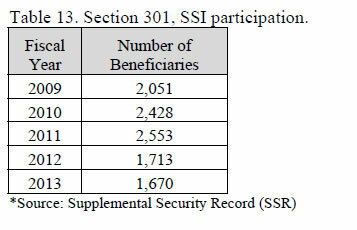 New beneficiaries would be required to consent to allow SSA to access these databases as a condition of benefit receipt. All other current due process and appeal rights would be preserved. Expand Authority to Require Authorization to Verify Financial Information for Overpayment Waiver Requests. SSA uses an automated process to verify the financial institution accounts of SSI recipients to improve payment accuracy. SSA has the authority to require applicants and beneficiaries to authorize the agency to get this information in connection with determining SSI eligibility. However, SSA cannot use this process for other determinations that involve consideration of financial institution account information. One such determination occurs when a beneficiary requests a waiver of recovery of an overpayment (whether an OASDI overpayment or an SSI one) or a change in the rate at which SSA withholds funds from a beneficiary’s payment to collect a prior overpayment. Determining whether someone qualifies for a waiver or a different rate of recovery can involve determining whether the person has the financial means to repay. This proposal would require OASDI recipients seeking overpayment waivers to grant SSA authority to certify financial information and thereby improve the accuracy of waivers. Currently, there is no automated method for verifying financial assets for overpayment waiver claims. Early Intervention Demonstrations. Building on bipartisan support for an early intervention demonstration appropriated in FY 2015, the FY 2016 Budget includes $50 million in discretionary research funding to continue support for our early intervention demonstration efforts. The Budget also includes a $350 million request for FY 2017- 2020 and a proposal to reauthorize SSA’s demonstration authority for the disability program. The renewed demonstration authority will help us continue to strengthen our disability program and test innovative strategies to help people with disabilities remain in the workforce. For example, by providing medical-vocational services prior to benefit receipt, we can evaluate whether such services can effectively help individuals with these impairments remain and succeed in school or the workforce, and perhaps avoid or delay a need for disability benefits. SSA is currently designing the initial early intervention demonstration project funded in FY 2015 and expects to issue a contract by the end of the calendar year. To date, SSA solicited feedback on the demonstration through a Request for Information, published a required statement for contractor feedback in Federal Business Opportunities, and held a meeting with a Federal Interagency Advisory Panel to solicit feedback on the scope and design of the demonstration. Program Integrity. In addition to our reviews of beneficiaries’ work activity, we also periodically examine whether a DI beneficiary continues to meet the medical criteria for entitlement. SSA’s appropriations determine how many medical continuing disability reviews we can perform. This proposal would repeal the discretionary cap adjustments enacted in the Balanced Budget and Emergency Deficit Control Act, as amended by the Budget Control Act, for SSA beginning in FY 2017 and instead provide a dedicated and dependable source of mandatory funding for these program integrity activities. CDRs and SSI redeterminations save billions of program dollars with only a comparatively small investment of administrative funds. Current estimates indicate that CDRs conducted in FY 2016 will yield a return on investment (ROI) of about $9 on average in net Federal program savings over 10 years per $1 budgeted for dedicated program integrity funding, including OASDI, SSI, Medicare and Medicaid program effects. Similarly, SSI nonmedical redeterminations conducted in FY 2016 will yield a ROI of about $4 on average of net Federal program savings over 10 years per $1 budgeted for dedicated program integrity funding, including SSI and Medicaid program effects. I thank you for your interest in our stewardship efforts related to return-to-work programs. I would be happy to answer any questions. survivor, and disability insurance totals shown above. Disability Programs (Apr. 3, 2006), Appendix A, pp. 6-7 (providing a point-in-time estimate of potential fraud cases out of a sample of over 1,500 cases). While we are equally committed to combating overpayments, fraud, and waste across all of our programs, this testimony will only discuss improper payments resulting from work in the DI program. in the national average wage index. 4 To be insured for Social Security Disability, most individuals must have worked substantially in five out of the prior ten years before the onset of disability. This is in addition to the general 10-year (40 quarters) work requirement needed to gain “fully” insured status. 6 SSA cost reimbursement is in addition to the allotment of Federal funds State VR agencies already receive from the Department of Education under Title I of the Rehabilitation Act of 1973 (as amended). 7 In 1999, Congress passed the Ticket to Work and Work Incentives Improvement Act, which established the Ticket to Work program. Congress intended the Ticket to Work program to expand the universe of service providers and to provide beneficiaries with choices beyond the State VR agencies to obtain the services and supports they need to secure and maintain employment. 8 Section 234 of the Social Security Act outlines provisions related to demonstration projects; however, our authority to initiate new demonstration projects lapsed in 2005. 9 Reports on the BOND can be found at: http://www.ssa.gov/disabilityresearch/offsetnational.htm. Social Security or Supplemental Security Income benefits based on disability. month (in 2013) usually demonstrate SGA for SSDI. Trial Work Period (TWP) (Section 222(c) of the Social Security Act)—Allows beneficiaries to test their ability to work for at least nine months. During the TWP, beneficiaries receive their full benefits regardless of how high their earnings might be as long as they have not fraudulently concealed work activity and they continue to have a disabling impairment. The TWP continues until the beneficiary accumulates nine months (not necessarily consecutive) in which he or she performed “services” within a rolling 60-consecutive-month period. In 2013, we consider work to be “services” if the beneficiary earns more than $750 a month, or works more than 80 selfemployed hours in a month. *Source: Disability Control File (DCF) rounded to nearest 500. 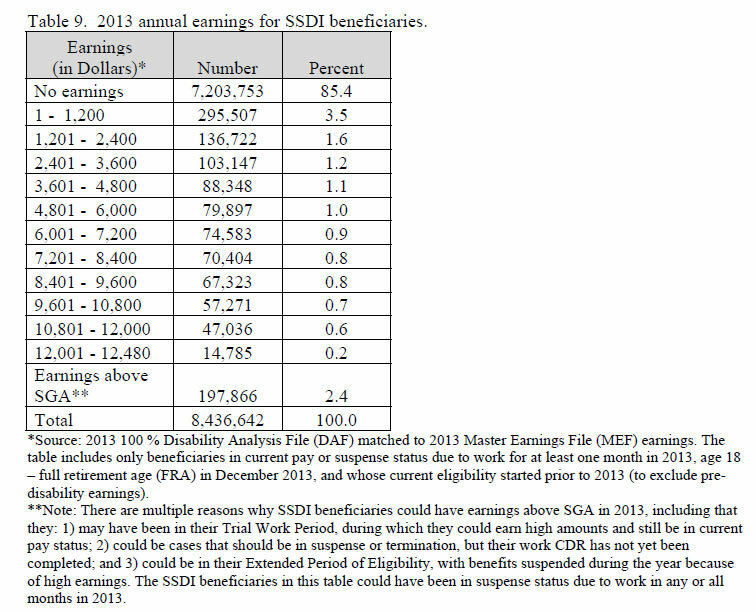 **Source: Disability Analysis File 2013 (DAF-13)/Master Earnings File (MEF) data, rounded to the nearest $500. increase as work CDRs for these years are completed. Extended Period of Eligibility (EPE) (Section 223(a)(1) of the Act)—At the end of the TWP, a 36-consecutive-month EPE begins, unless we find that the beneficiary has medically improved and no longer meets the definition of disability. During the EPE, we pay benefits for the first 2 month that earnings exceed SGA and the next 2 months, (we refer to this as the “grace period”); and any month the beneficiary’s earnings do not exceed SGA. After the EPE ends, benefits terminate if a beneficiary's earnings exceed the SGA level in any month. ***Source: Disability Control File (DCF) rounded to nearest $10. Unsuccessful Work Attempts (20 CFR 404.1574(c) and 20 CFR 416.974(c))—We disregard earnings from work attempts of six months or less that were stopped or reduced to below SGA due to the beneficiary’s impairment, or the removal of special conditions. In this update, we changed our data source from eWork to the Disability Control File (DCF). Extended Medicare (Section 226(b) of the Act) — If a beneficiary’s benefits are terminated because of work, Medicare coverage will continue for at least 93 months after the end of the trial work period (at least eight and one-half years from first return to work). In this update, we changed our data source from the DCF to the Master Beneficiary Record (MBR) because it is a more accurate source for this data element. Expedited Reinstatement (EXR) (Section 223(i) and 1631(p) of the Act) —We may be able to start benefits again without a new application if a person stops working within five years of the previous termination date. To be eligible for EXR, the beneficiary must: 1) have had his or her benefits terminated due to work; 2) become unable to continue working at SGA, within 5 years of that termination; and 3) have the same or a related medical impairment. Initial Reinstatement Period (IRP) (Section 223(i) of the Act) —When a beneficiary becomes entitled to EXR, the 24-month IRP begins. During the IRP, we pay benefits for any months the beneficiary’s earnings do not exceed SGA. After a beneficiary receives 24 months of payable benefits, the IRP is completed, and the beneficiary is eligible for a new nine-month TWP and EPE. Beneficiary Earnings—When beneficiaries return to work (self-employment or for wages) they are entitled to the work incentives discussed above. This allows them to test their ability to work while still receiving benefits. 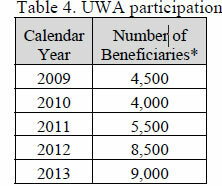 Beneficiaries taking part in these work incentives will have earnings reported to their record. Impairment Related Work Expenses (Section 1612(b)(4)(B)(ii) of the Act) – We exclude outof- pocket costs for certain impairment-related items and services needed to work when we count earned income for SSI. must contain an occupational goal that we expect to increase the individual's prospect for selfsupport. It must also specify beginning and ending dates, and target dates for reaching milestones that reflect progress towards achievement of the occupational goal. “Section 301” Payment Continuation (Section 225(b) and 1631(a)(6) of the Act (created by section 301 of Public Law 96-265))—This provision allows for continuation of SSDI or SSI disability benefits to individuals whose disability medically ceases while they are participating in a vocational rehabilitation or similar program. To be eligible the individual must have begun participating before the month his or her disability ceased. We must also determine that completion of the program will increase the likelihood that the individual will not return to the disability benefit rolls. Medicaid While Working ((Section 1619(b) of the Act) – Medicaid coverage can continue even if earnings are too high to allow an SSI payment. Medicaid coverage will continue until an individual's earnings reach an annual “threshold” level. Each State establishes a threshold level every year. We can also determine individualized thresholds for individuals with extremely high medical costs they would be unable to pay without Medicaid.